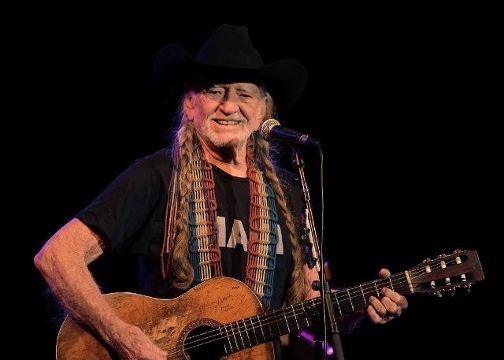 Willie Nelson, Jamey Johnson, and Ryan Bingham performed in front of a packed house at the O’Reilly Family Event Center at Drury University Friday night. Merle Haggard was originally on the ticket with Willie promoting their new album together titled Django and Jimmie but failing health had kept Merle off the tour and he cancelled all upcoming concert dates just a few weeks ago. Merle Haggard died this past Wednesday, April 6, 2016, due to complications with pneumonia. Jamey Johnson performed an entire set of Merle’s songs and Willie closed out the show with Johnson and Bingham singing Merle’s famous song Okie from Muskogee. 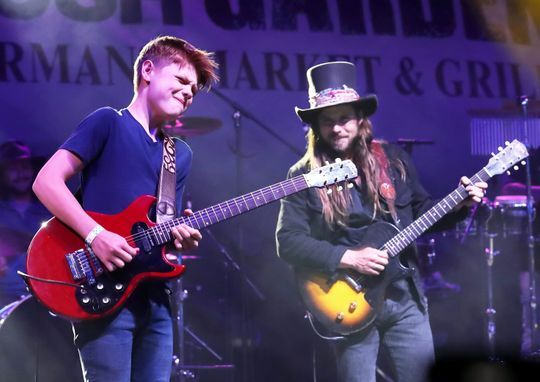 Willie’s son Lucas Nelson was a great addition to Willie’s band playing some backup rhythm guitar and he electrified the audience when he took center stage to sing Texas Flood with some incredible guitar work. The annual music festival at the Indian Wells Tennis Garden has had five different names or title sponsors in the past five years. But this weekend’s Wedbush Garden Jam will be remembered as a shred fest. A star for much of the weekend was Toby Lee, a 14-year-old British guitarist who has been called “a future superstar of the blues” by Joe Bonamassa. Lee, who is appearing on Peter Frampton’s next album, played both evenings on a second stage with David, Carey and session guitarist “Mic Dangerously” De La Torre. Nelson brought Lee to the main stage Friday night to play Stevie Ray Vaughan’s blues classic, “Flooding Down in Texas,” which Nelson turned into a highlight of the 2017 Stagecoach festival when he played it with his dad, Willie Nelson. This time, Lee proved an equal partner to the 30-year-old Nelson by not trying to upstage him, but just listening for ideas to bounce back. They both got a standing ovation. But Nelson elevated his game on his next song, “Set Me Down On A Cloud.” It didn’t call for a scorching guitar solo, like “Flooding Down in Texas,” but Nelson added a beautiful, evocative solo that was simply inspiring. Lukas explained how he came up with the guitar intro on the Oscar and Grammy Award-winning Bradley Cooper and Lady Gaga song, “Shallow,” for which he gave most of the songwriting credit to Mark Ronson’s “team.” Then Hunter Elizabeth came on to sing the Gaga part and, after a rough start, got to heaven on the high notes to give that beautiful song its due. Nelson played a little hoe-down music on “Stay A Little Longer,” got the crowd to sing along on the catchy refrain to “Find Yourself” and had them absolutely silent for his “Turn Off the News,” in which he urged listeners to instead focus on raising their kids to be good people,” providing another example of his old soul. South Lake Tahoe, Nev. — The baby grand Steinway piano in Willie Nelson’s hotel suite is flanked by a window overlooking Nevada and a flight of stairs leading to a bedroom overlooking California. Nelson, dressed in blue jeans, a blue T-shirt and blue tennis shoes is conferring with an officious looking gentleman in a conservative blue suit. Everything else in the room with the exception of the piano and six huge pillows in various shades of red, maroon and orange is geige or crystal — the sofa, the fireplace, the chairs, the thick carpet, the magazine rack, even the bar and the stereo system. Nelson’s conference is interrupted by a woman’s voice from the kitchen-dining area, located in the loft of the split-level suite. “Dinner is served, Mr. Nelson,” the voice says. Willie Nelson, the one-time door-to-door book salesman from Abbott, Texas, who has played every gin joint from Key West to the Puget Sound, has come a long way from the days of knocking about in Nashville and playing on the back of flatbed trucks for the opening of a Ford dealership in some one-horse town. Nelson is in the middle of a 2-week engagement at the luxurious Harrah’s Hotel in Lake Tahoe, an engagement interrupted for ao one-night only performance at the White House. Nelson rushes through his meal (one of the few times he rushes through anything) and walks back down into the living room. He strolls around to the couch and sits. He looks at the luxury that surrounds him and remembers those earlier days, shows in such unlavish places as Panther Hall in Fort Worth, or the Sportatorium in Dallas, where Nelson returns Wednesday night — exactly one week after his White House gig — for a show with Delbert McClintock and Ray Wylie Hubbard. And what has nelson done to generate all this recent acclaim? What has he done differently to change the way the country music establishment regards him during the past couple of years? Willie was one of the first of the breedof country singers labeled “progressive country.” There is really nothing progressive about Nelson’s style. In fact, if anything, Nelson’s music is rooted in the simplistic patterns of Hank Williams, Kitty Wells and Roy Acuff. 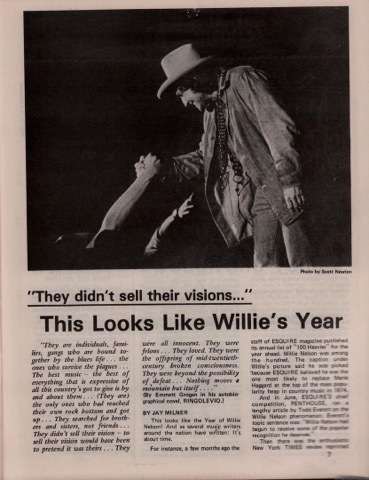 The strange thing about the Willie Nelson success story is that it was the young people — the crowd with the musical diet of the Jefferson Airplane, the Doors, Big Brother and the Holding Company — that first tuned into Willie Nelson and responded to his songs. Willie Nelson performs two shows a night at Harrah’s. The audience at the 8:15 dinner show consist of the well-heeled, because Harrah’s Showcase is the place to be at Lake Tahoe. The second show, which begins at midnight, draws the hard-core Nelson fanatics. They whistle. They stomp. They cheer. They shout. They won’t let Willie leave the stage, forcing him back for seven encores. And Willie gives them a show they will not soon forget. The songs are the same, but Willie and the band play them with abandon. An instrumental jam on Whiskey River (a song he sings three times for an estatic second-show audience) sounds more like the Allman Brother’s Band than hard-line country music. But this is Willie Nelson. His version of “Georgia on My Mind” in these late night shows has an ending that redefines the term ‘country soul.’ His treatment of ‘Amazing Grace’ is pure enough to reform the gamblers who are tossing silver dollars into slot machines, onto crap tables, around roulette wheels and in the general direction of the black jack dealers not more than a couple hundred feet from the stage where Willie Nelson is singing. “Even so more in a place like this (a gambling casino), that song is enjoyed because it is so different than what they are hearing around them,” Nelson says. And they can get in to a song like ‘Amazing Grace’ and ‘Will the Circle be Unbroken’ beecause they don’t expect to find it here. Hopefully, the excitement of a Willie Nelson performance in this atmosphere will be captured on his next album. “My next release is a live album,” Nelson says. “The last time I was here I cut a live album. The new album will be coming out in October.” The album, a two-record set, will contain all of the familiar Nelson songs plus his version of Rodney Crowel’s ‘Til I Gain Control Again’, which he has recently included in his shows. It will not incude any new Nelson compositions. “I’ve got some new songs, ‘She’s Gone’, ‘Angel Flying Too Close to the Sun’, and ‘Is the Better Part Over’? I want to get enough for a new album. I want to have a whole album of new songs. The 1978 picnic came during the Texxas World Music Festival at the Cotton Bowl. “The accommodations were great, the stage was fine, the sound was good, the shows were good, but I don’t think the atmosphere was a Fourth of July Picnic atmosphere,” Nelson says. “It would have been a lot more uncomfortable out there in a pasture, somewhere, but personally I would have liked that more. The Cotton Bowl would be a good place to do a show, in a cooler time of year. And for the Fourth of July it would be better to have it outside where you have a breeze, a lake you can go swimming. And I think people enjoy the fact that they are not that well controlled. Everything is too easy in the Cotton Bowl. I mean, you can go get a snow cone, a drink of water, or go to the bathroom. That’ s not a picnic. They’re supposed to be rougher than that. Willie Nelson is 45 years old and to many people around the country, who learned about Willie through “Blue Eyes’, an overnight success, “a real Cinderella story,” Willie says with a laugh. Not only has he seen it all, he has played in every place he’s seen. Now Willie has just about done it all. He has gone from the very bottom to the very top. Is there any reason to go any longer? Has he every thought about getting out the rat race he’s sentenced himself to? Particle Kid builds beautiful things only to destroy them. The experimental rock band is the brainchild of J. Micah Nelson (yes, son to Willie Nelson) who brought the project to Belly Up Aspen on Feb. 23 in an opening slot for The Flaming Lips. 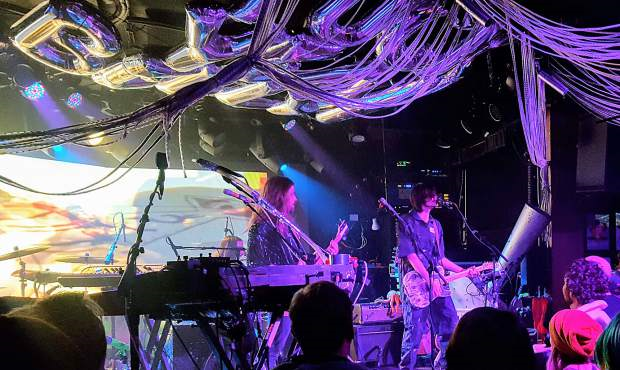 Playing to a nearly full house of early-arriving, enthusiastic, attentive and heavily costumed Lips fans, Nelson — playing with a drummer and bassist — showcased his strange and inspired vision for the future of guitar rock. He set the tone at the outset with a jarring dose of extended feedback, emerging from the haze of noise with “Myssus Crow” — from his 2017 album “Everything is Bulls—” — which juxtaposes jangly guitars and sweet bubblegum-pop vocals with harsh and brutal passages of distorted guitar. If he wanted to, there’s no doubt Nelson, 27, could be writing pop hits and headlining shows with a more slick and commercial sound — he also could be, as evidenced by a handful of intricate guitar solos, campaigning to be his generation’s guitar hero. But clearly he isn’t interested in that with Particle Kid. Instead, the songs that Nelson showcased in this 45-minute set were studies in contrast and subversion. On “Hollyweird,” from his recent collaborative album with folk-punk rocker Sunny War, he started it as an electric country ballad about Los Angeles, then tore it apart in non-idiomatic bursts of distortion, only to emerge again whistling and singing a sweet pop melody. By the time Nelson started sweetly singing “I’m in love/I’m in love/I’m in love with the ocean” during the saccharine opening of “The Ocean,” the audience was bracing for it to turn ugly, and it did with a heavy metal burst of bass drum thuds and sludgy guitar. There’s a playful Frank Zappa spirit in Particle Kid’s arty rock and a refreshing indifference to the pop trends of the moment. His mercurial guitar-based sound, with touches of folk and punches of distortion, is occasionally punctuated with glitchy electronic samples. Nelson closed his set with the clever and subversive “Everything is Bulls—,” which recaps the history of life on Earth, from the first bit of conscious matter through our 21st century reality of Snapchat and drone bombs and cat videos. A kinetic performer, Nelson bounded around the stage — cluttered with the Lips’ gear, balloons and strings of lights — and ended by smashing a mic stand and doing a trust fall into the crowd. Performing in a paint-spattered jumpsuit, with a mop of dark hair covering his eyes through most of the set, Nelson regularly raised a fist in the air to pump up the crowd and express his gratitude for their attention. “Never in my wildest, greatest fantasy and dreams did I think I’d get to share this stage with the greatest band in the world: The Flaming Lips,” he told the Aspen crowd. Nelson has been releasing music as Particle Kid since 2012, beginning with supremely DIY cassette-tape releases. He dropped two albums in 2017 — a self-titled disc along with “Everything is Bulls—” — and last year’s “Particle War” with Sunny War. His Particle Kid tours are bare-bones affairs — hitting the road to play clubs with no crew — but he’s no stranger to full rock star treatment as a son of Willie Nelson, a member of Neil Young’s touring and studio band and multi-instrumentalist for his brother Lukas Nelson’s roots rock outfit the Promise of the Real (an Aspen favorite, they’re back at Belly Up for a sold-out show March 19). But what Nelson seems to be after with Particle Kid is artistic freedom. He also is an animator, experimental artist and general visionary weirdo with countless multimedia projects going beyond his musical ventures. Rolling Stone included him among the next generation of visionary artists its “New Classics” series last year. Whether it’s as Particle Kid or in some other guise, we’re going to be hearing a lot from Micah Nelson in the years to come. 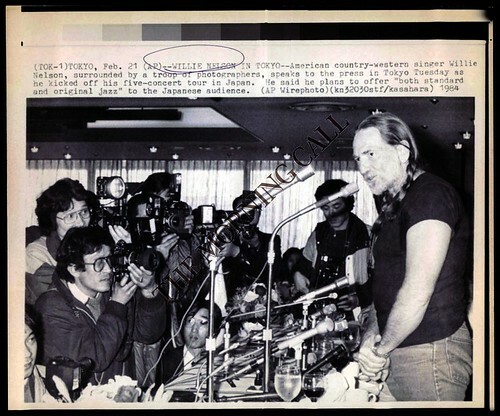 American country western singer Willie Nelson, surrounded by a troop of photographers, speaks to the press in Tokyo, as he kicked off his five-city tour in Japan. He said he intends to offer “both standard and original jazz” to the Japanese audience. 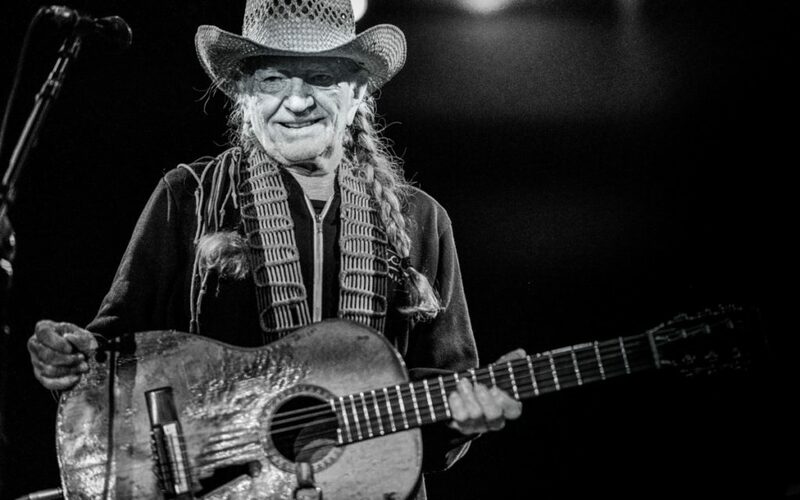 Being 85 hasn’t appeared to slow down the Red Headed Stranger at all. 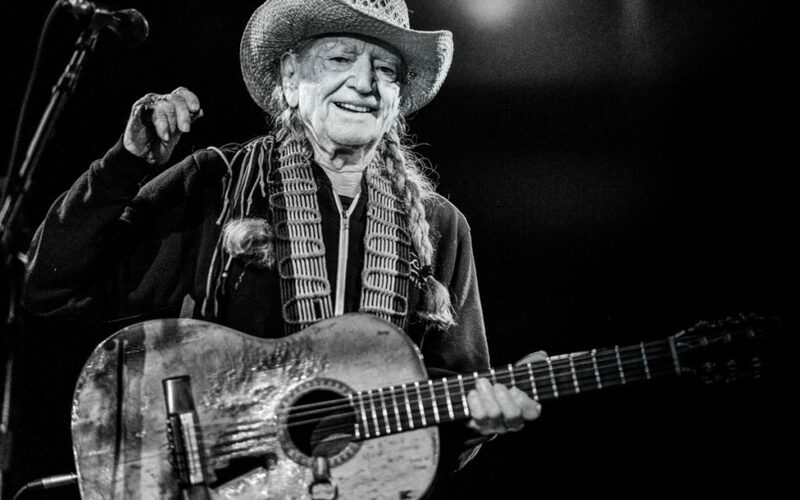 West Texans will have the chance to see the star perform live with Willie Nelson & Family next week. 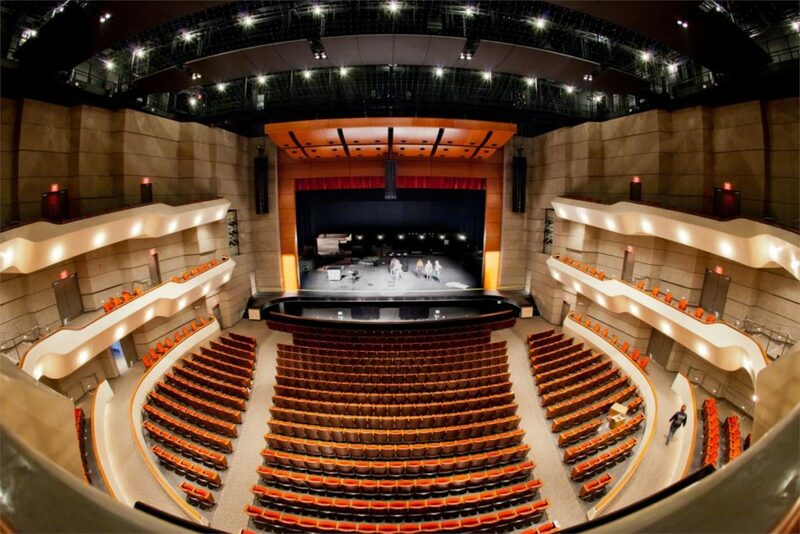 Willie Nelson & Family are scheduled to perform Tuesday at the Wagner Noel Performing Arts Center. Nelson’s prolific career includes music, moves and helping found Farm Aid in 1985. Nelson’s new Grammy is his eighth and he has been nominated a whopping 51 times. This year his album beat out “Love Is Here To Stay” by Tony Bennett and Diana Krall, “Nat “King” Cole & Me” by Gregory Porter, “Standards (Deluxe)” by Seal and “The Music… The Mem’ries…The Magic!” by Barbra Streisand. 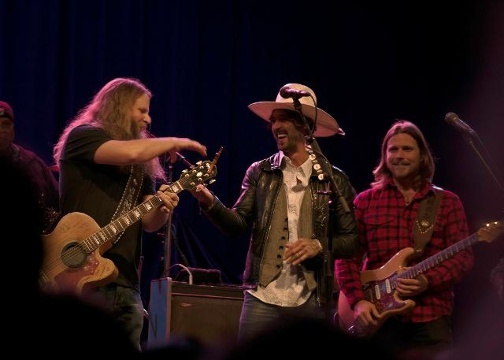 The Associated Press reported that Kacey Musgraves, Dave Matthews and Lukas Nelson saluted the outlaw king of country music with tributes and performances. Nelson’s songs are so iconic, “they’re never going to die, and let’s get real: He’s probably not either,” she said Matthews was joined by two of Nelson’s sons, Micah and Lukas, to help cover songs like “Crazy,” and “I Thought About You, Lord.” Lukas Nelson, who worked on the soundtrack and film for “A Star Is Born” with Lady Gaga and Bradley Cooper, can sing a dead-on impersonation of his father’s unique high singing style. His 1982 hit “Always on My Mind” was inducted into the Grammy Hall of Fame in 2008. Willie Nelson can’t keep up this kind of schedule any more. Or can he? The wear and tear of 60 years on the road shows, like the hundreds of names scratched into the soundboard of his vintage Martin N-20 acoustic guitar. Standing in clear bright stage lights in front of a paired down band, he embraces every nick and dent like the Alamo embraces bullet holes. And like that old mission, he has become an important piece of the mythology of Texas. Willie Nelson, Texas icon and last of the outlaws, finishes a signature tune, looks you in the eyes and smiles. Overwhelming odds don’t matter. We’re from Texas. Willie Nelson at a sold out Bomb Factory, Dallas Texas. See slide show with lots more photos at Dallas Observer website. The Half Nelson is expected to open in early March at 312 E. 2nd St., Davenport. The view of what’s inside may be hidden from passersby on East 2nd Street in downtown Davenport, but the paper coverings show something: The face — well, half of it — of country singer Willie Nelson. The sign is hinting at the eatery — called The Half Nelson — expected to open in early March, said co-owner Matthew Osborn. The idea surfaced several years ago for Osborn, a 28-year-old Davenport native who has long had a role in his family’s restaurant business. His parents, Mike and Carla Osborn, own Miss Mamie’s Catfish House in Moline and Mo Brady’s Steakhouse on Brady Street in Davenport. He’s especially excited about opening The Half Nelson. “This restaurant will be different from those in every way,” he said, comparing it to his family’s other restaurants. After landing on the location, Osborn said inspiration struck — for the design, menu and name — of the restaurant, which will also feature an outdoor dining area. The 4,000-square-foot Half Nelson takes up the east half of the historic building at 321 E. 2nd St., Davenport. It was built in 1922 by the N.O. Nelson Manufacturing Co., a Missouri-based manufacturer of plumbing and heating systems. “We’re inspired by old-school things like a beef wellington and figuring out a way to make it more interesting,” he said. Osborn said he was set on opening the restaurant in downtown Davenport. 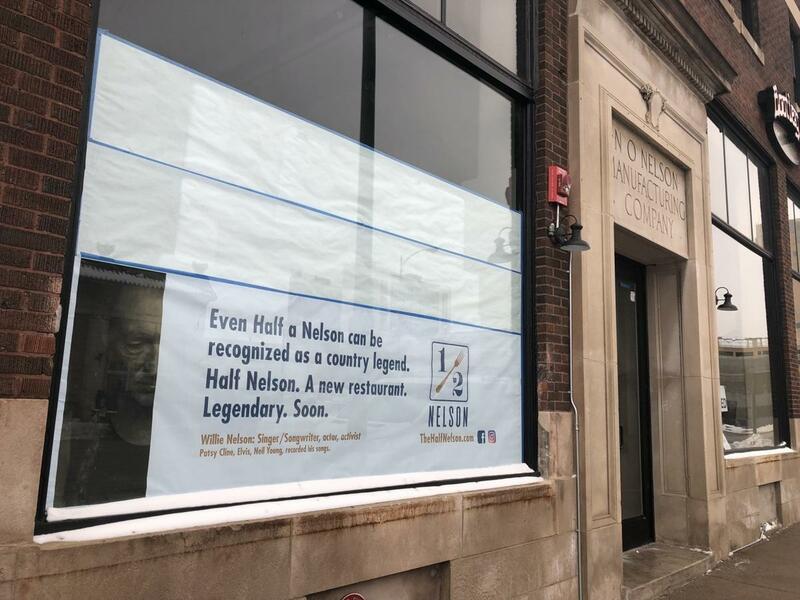 When it opens, The Half Nelson, which is across the street from Great River Brewery, will be the latest in a string of developments in downtown Davenport over the last few years. The Half Nelson’s next-door neighbor, Bootleg Hill Honey Meads, opened in November and Roam, a coffee-shop/restaurant/cocktail bar, opened nearby on East River Drive in late December. Other relatively recent additions to the area include Abernathy’s, the Triple Crown Whiskey Bar and Raccoon Motel, Armored Gardens and Ruby’s Beers, Bikes & Brats. Willie Nelson and Merle Haggard” that just would have been easy business. And, put in terms of copyright and back catalog, it would have been a follow-through on “Pancho and Lefty,”  the hit record they made together almost 25 years ago. But to triangulate them with Ray Price, as the new record “Last of the Breed” does, is to structure a summit meeting on honky-tonk singing. The three singers are connected by lots of small sum items like the fact that Mr. Nelson used to be Mr. Price’s bass player but also in one big way. They are all magnetized toward the sound of Bob Will’s Texas swing. Mr. Haggard, for his part, seems drawn to the kind of front man Wills was: a sporadic fiddle player, spontaneous organizer of arrangements and agent of the unpredictable. Mr. Price, for his part, long ago adapted Will’s twin-fiddle breaks, folding them into nearly all his honky-tonk hits of the 1950s and ’60s. As for Mr. Nelson, a Texan, a country singer and an improviser, Wills is part of his light and air. “Last of the Breed” came out last week on Lost Highway Records. The inevitable short and gentlemanly tour that followed. Mr. Price is 81, Mr. Haggard 69, Mr. Nelson 73 would naturally be the live version of the record. Right? There are 22 songs on the album, from the repertory of their favorite 40s and 50s country songwriters. Wouldn’t it be enough to take that and round it off with some extras? Sure. But what happened at Radio City Music Hall on Thursday was infinitely better. The beginning of the show was Mr. Price’s, and he played a half-hour set with his backup band, the Cherokee Cowboys. In a gray suit and red tie and moving with slow grace, he sang in his latter-day vocal style over his early-days music. The music was ironbound, honky-tonk shuffles with a steel guitar and twin fiddles; that vocal style was a crisp baritone that never bent notes, ennobling every phrase of “Crazy Arms” or”I Won’t Mention It Again” or “The Other Woman (in My Life), making the deadbeats and emotional anarchists in the songs like stand-up guys. After a pause Mr. Haggard appeared, with the Western-swing band Asleep at the Wheel as his backup. He looked itchy and inscrutable. He picked up his fiddle, and things got deep very quickly. He ordered up “Take Me Back to Tulsa” singing in his relaxed, froggy voice, picking the order of soloists, and the band heated up in the out-chorus. They played an old public-domain blues, still warming up the fingers. Then began about 45 minutes of music that represented the best of what you can get, on the best of nights, from experienced, ornery types. 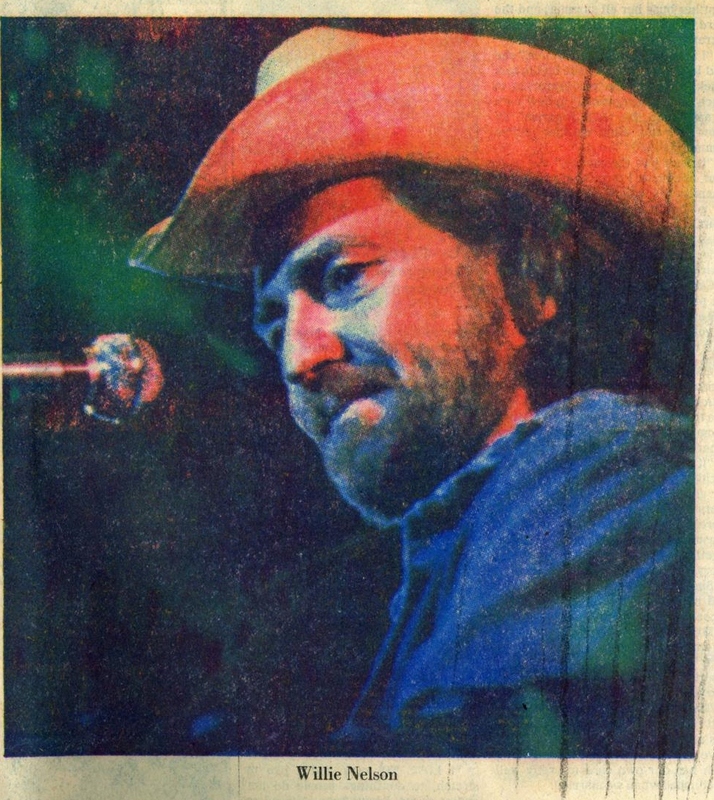 Song after song, with endless differences in the shadings and rhythms of his vocal phrasing, and with modest, clear-minded guitar solos, Mr. Haggard made copyright a dead issue. He used his restlessness to melt down his hits, to undo them and turn them back into process and possibility. He worked within the changing spaces of a flexible band; he sang the first verse of “Sing Me Back Home” by himself. He smuggled the line “Honey, don’t worry about what George Bush does” into the lyrics of “That’s the Way Love Goes”; he ordered solos in “Think I’ll Just Stay Here and Drink”; he engaged Mickey Raphael, the harmonica player from Mr. Nelson’s band, who played short solos and obbligatos as if he were another guitarist. Mr. Nelson arrived, smiley but wearing a similar inscrutability, and together the two continued the weird work that Mr. Haggard had begun. Mr. Price reappeared for a few songs from the record, including two from the great ark of Wills (“Roly Poly” and “Please Don’t Leave Me Any More Darlin’ and a rising-to-the-occasion version of “Night Life” in which he and the band slowly surged to a thundering final chorus. This was a more orderly part of the show: elegant, old school, moving. The evening finally turned into the hero-worship stage, with Mr. Nelson taking over. You probably know the coordinates: amiable-vagabond music (“Whiskey River” and “On the Road Again”) and a funny new song called “You Don’t Think I’m Funny Anymore.” It was all better than good. But that delicate, tenebrous, alchemical middle section of the concert: that was something else, something unknowable. 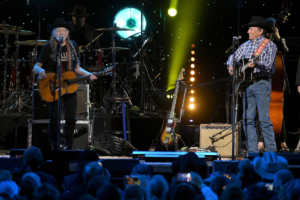 Willie Nelson and George Strait perform at Willie: Life & Songs Of An American Outlaw at Bridgestone Arena on Jan. 12, 2018 in Nashville, Tenn. 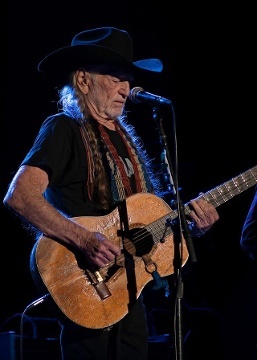 Given the universal appeal and introspective catharsis that marks the best of Willie Nelson’s work, the sheer range of talent who took the stage to celebrate the life and career of Nelson at Nashville’s Bridgestone Arena for Willie: Life & Songs Of An American Outlaw should have come as no surprise. The following five performances were highlights of a night that was recorded and is slated to be aired as a major broadcast special on A&E Network in 2019. While Lukas is arguably better known around Nashville, thanks to his appearances at various local events in the wake of the release of the 2017 album Lukas Nelson & Promise of the Real and his work on A Star Is Born, Micah stunned those unfamiliar with his vocal talents in the future-folk project Particle Kid by embracing the classical and Spanish influences found within the gospel-tinged “I Thought About You, Lord.” He then accompanied his brother on a pair of their father’s standards that span across his career, as Lukas’ talent shined through “Time of the Preacher” (from Willie’s 1975 commercial breakthrough Red Headed Stranger) and “The Songwriters,” a cut from Willie’s 2014 album Band of Brothers. When the bearded Johnson took the stage, several people in the crowd excitedly mistook the singer for Chris Stapleton, who had opened the show earlier with a rousing rendition of “Whiskey River.” The difference between Stapleton’s performance — which was a crowd pleaser, don’t get me wrong — and what the audience witnessed from Johnson’s handling of the oft-covered “Georgia on My Mind” was that the latter resulted in a standing ovation that began a full minute before the final lyrics were bellowed by an artist that deserves much more recognition than he currently has. It’s remarkable to realize that, before last night’s performance, George Strait and Nelson had never performed together. 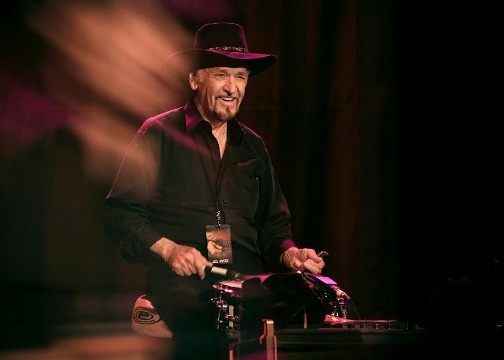 The two reigned as key talents in country music in the ’80s, and Willie has made a career out of performing duets with fellow legends on multiple projects. 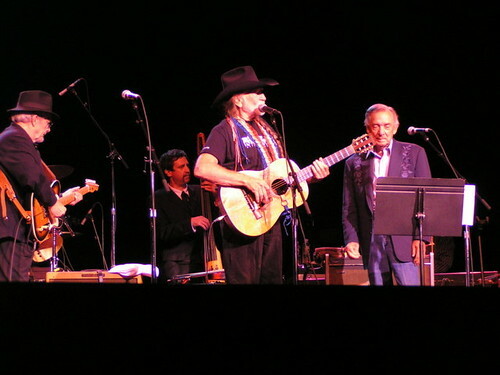 It made sense, then, that the first time they would share a stage Strait would mark the occasion by debuting a new song seemingly titled “I Ain’t Never Got to Sing One With Willie.” The tune, making light of the two entering their twilight years as performers, had the two arguing over whether this occasion finally made Strait’s career or ruined it. TV tapings can be a drag. 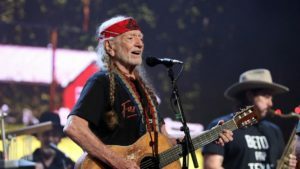 But amid the set changes and staged introductions from host Ed Helms at Saturday night’s all-star tribute to Willie Nelson in Nashville, there were some true moments of musical spontaneity — particularly from the guest of honor. 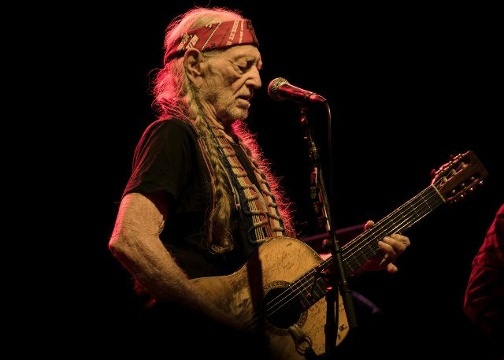 Titled Willie: Life & Songs of an American Outlaw and produced by Blackbird Presents, the concert, which will air sometime this year on A&E, assembled a powerful cast of guest artists to pay tribute to the 85-year-old. George Strait, Kris Kristofferson, Emmylou Harris, Jimmy Buffett, Jason Isbell, Sturgill Simpson and Eric Church all performed songs from, about or popularized by Nelson, often in collaboration with the Country Music Hall of Fame member himself. 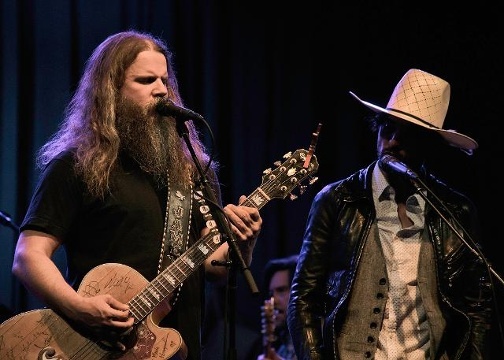 Chris Stapleton opened the evening — like Nelson has been doing since the Seventies — with Johnny Bush’s “Whiskey River,” adding extra muscle to the song with his patented growl and establishing the tone of the tribute: these wouldn’t be paint-by-number re-creations. Rather, the Nelson catalog had room to breathe, thanks to bandleader Don Was’s versatile A-list house band, which included Amanda Shires, Jamey Johnson, Audley Freed, Paul Franklin and Nelson’s longtime harmonica player Mickey Raphael. After joking that this was his first time performing inside the Bridgestone Arena, Sturgill Simpson paid tribute to Nelson with “Red Headed Rounder,” an unreleased song Merle Haggard wrote about his friend. Earlier, fellow Nashville boundary-pusher Jason Isbell nodded to Nelson’s blues influences with “Milk Cow Blues” and also found himself at the center of some entertainment news: The night’s co-host W. Earl Brown, who played Dan Dority on HBO’s Deadwood, confirmed that Isbell appears in the upcoming Deadwood Statehood movie. But it was the more subdued, stripped-down performances that carried the most emotional weight, including a consecutive three-song set from three of country’s untouchable vocalists. Alison Krauss’s spine-tingling “Angel Flying Too Close to the Ground” earned a standing ovation, Vince Gill’s “Blue Eyes Cryin’ in the Rain” hushed the arena and Jamey Johnson’s booming “Georgia on My Mind” made us all wish — yet again — that he’d release new music of his own. That less is more approach most applied to Nelson, a famously idiosyncratic vocalist who can get swallowed up by a large band. On Saturday, he was at his best when leading Harris and Rodney Crowell in “Til’ I Gain Control Again” and the entire cast in the finale medley of “On the Road Again,” “May the Circle Be Unbroken,” “I’ll Fly Away” and “Roll Me Up and Smoke Me.” While huge, swelling soundtracks play well in arenas and for TV, Nelson’s continued prowess would be better highlighted backed by a small combo or even his trusty Family Band. 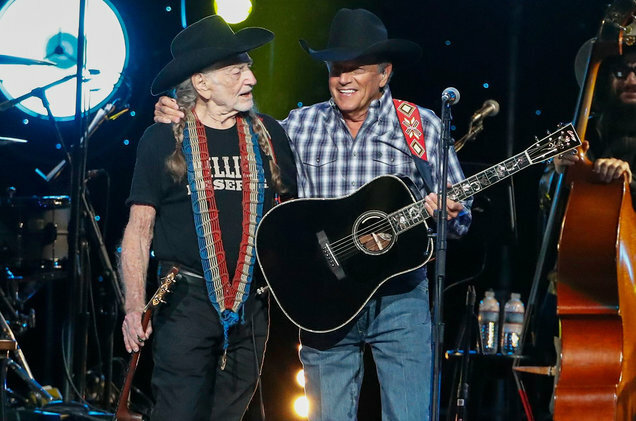 But it was on the new Strait song “Sing One With Willie,” off Strait’s upcoming album, where the pair displayed a mischievous chemistry that underscored the camaraderie of the tribute show. A tongue-in-cheek lament written by Strait, Nelson, Bubba Strait and Buddy Cannon about how the King of Country has never been asked to duet with the Red Headed Stranger, the track found both men pining for the other. Chef Bryan Lee Weaver has earned legions of fans for his work at Butcher & Bee, a Mediterranean-inspired eatery in East Nashville. However, the chef has a secret passion for the cuisine of the American Southwest, born from years working in kitchens in Colorado and California. In particular, Weaver is a big fan of a proper breakfast taco, and he has designed his next restaurant and bar project around that humble Southwestern classic dish as well as some fine smoked beef brisket and a green chile cheeseburger. 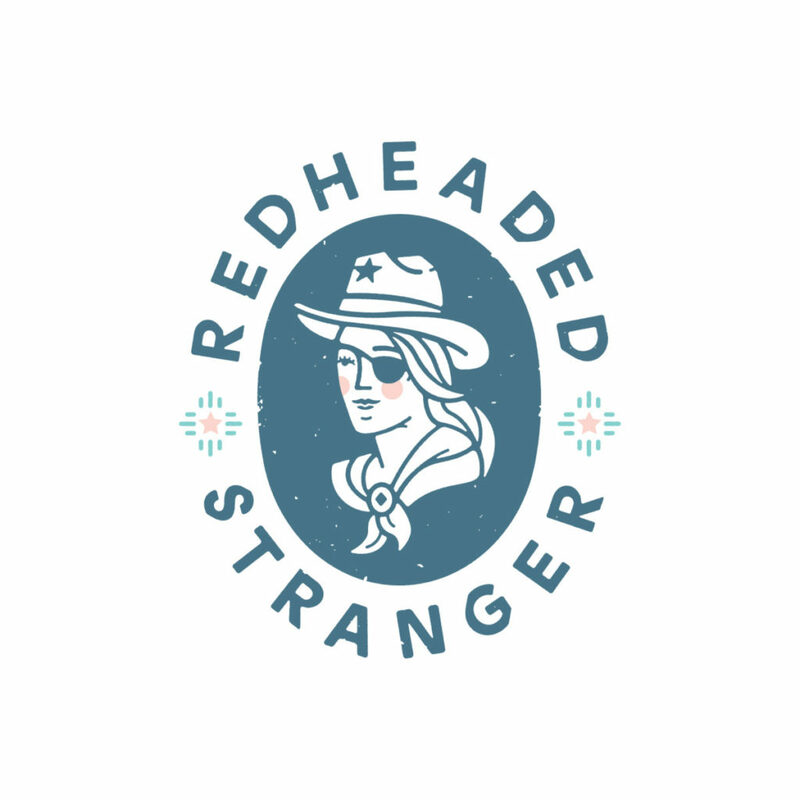 Named Red Headed Stranger after one of his musical heroes, Willie Nelson, Weaver is proud to have been granted permission to use the name by Willie’s granddaughter Raelyn Nelson. She also promised to be a regular customer at the Meridian St. restaurant when it opens early in the spring of 2019.